The antigay group should reveal the names of donors to its 2009 campaign against marriage equality in the state, the court ruled. 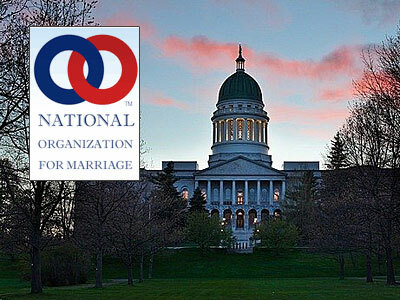 The National Organization for Marriage cannot withhold the names of donors to its 2009 effort to repeal a marriage equality law in Maine, the state’s highest court ruled Thursday. The Maine Supreme Judicial Court affirmed a ruling by the Kennebec County Superior Court, rejecting “NOM’s arguments that subpoenas issued by the Maine Commission on Governmental Ethics and Elections Practices violate donors’ First Amendment rights and expose them to ‘threats, harassment and reprisal,’” the Lewiston Sun-Journal reports. If NOM solicited donations specifically for the Maine campaign, it should have provided donors’ names to the commission, the court ruled. But NOM had not even registered as a political action committee, as required by Maine law. The Maine legislature passed a marriage equality law in 2009, but voters repealed it via ballot initiative. Another initiative campaign led to the restoration of equal marriage rights last year. NOM complied with state campaign finance laws in the latter election. The ruling is the latest of several against NOM’s attempts to shield donors’ identities. No word yet on NOM’s reaction; read The Advocate’s investigation of the group’s finances here.